The Honda Pilot and the Toyota Highlander have always been compared to each other. Both models were early entries into the now ubiquitous crossover SUV market, and they have often competed for the top spot in the class. But when you look at the current Highlander, and the forthcoming Pilot, it is clear which vehicle is resting on its laurels and which vehicle is committed to doing things better. The 2015 Honda Pilot is simply one of the most functional and versatile vehicles on the market right now, and it is on its way to Middletown Honda. Visit the Mechanicstown-area’s supreme Honda dealership at 520 Rte 211 E, Middletown, NY 10941. If you have been thinking about a Highlander, don’t commit to anything until you check out the new Pilot. The 2015 Honda Pilot and the 2014 Toyota Highlander have similar engine optioins, but when you dive into the power numbers, the differences between Honda and Toyota engineering become clear. The base Highlander comes with a 2.7L V-4 16-valve DOHC engine that puts out 185 hp and 184 lb-ft of torque. The base Pilot comes with a 3.5L V-6 24-valve SOHC engine that puts out 250 hp and 253 lb-ft of torque. Highlander drivers can upgrade to a 3.5L V-6 24-valve DOHC engine that puts out 270 hp and 248 lb-ft of torque, but this extra power comes at an extra cost. The Pilot comes with functional power at every trim. The two vehicles have almost identical fuel economy, with the Pilot getting 18 mpg in the city, 25 mpg on the highway and 21 mpg combined. The Highlander gets 19 mpg in the city, 25 mpg on the highway, and 21 mpg combined with the V-6 option, and an underwhelming 22 mpg combined with the V-4. Both of these vehicles come with long lists of standard and available features, but the differences are revealing. For instance, the Pilot comes standard with automatic dual-zone climate control, a feature that is not available in any Highlander but really important if you have multiple passengers. Pilot driver’s can also upgrade to a leather-wrapped steering wheel while Highlander drivers will have to make due without. A rear electronic parking aid is another option that is only available to people with a Pilot. The new Pilot also comes with two unique package options that offer premium upgrades for a modest cost. 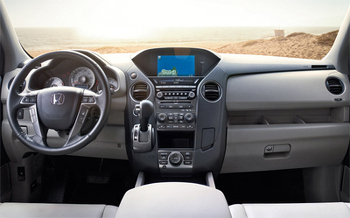 The Navi package adds a top-of-the-line voice-controlled navigation system. The RES package supplies a rear entertainment system that allows passengers to watch movies and play video games on the road. These features are available on the Highlander, but only by choosing expensive trim upgrades that come with other features you may not want or need. The interior is where the 2015 Honda Pilot really separates itself from 2014 Toyota Highlander, and that’s significant. Drivers that choose these vehicles are typically looking for ample cargo and passenger room, versatile configuration options, and whole-family comfort. The Pilot simply does better at providing all these must haves. 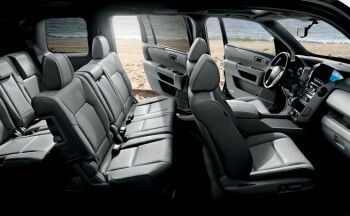 Cargo volume in the Pilot is 18 cu-ft with the rear seats up and 87 cu-ft with the rear seats folded down. In the Highlander, those numbers fall to 13.8 and 83.7 cu-ft. Total passenger volume in the Pilot is 153.7 cu-ft but only 145 cu-ft in the Highlander. The Pilot also has 500 more pounds of towing capacity, and available roof racks if you need to maximize hauling capacity. The shape of these two vehicles also affects the utility of the interior. The Pilot has a straight, flat, box-like design, while the Highlander goes more for rounded edges and sharp angles. When you are actually working with the space, the Pilot is much easier to load and unload because its body shape is inspired by functionality rather than looks. Spend a day riding in a Highlander and then spend the next day riding in a Pilot, and you’ll have no trouble deciding which vehicle you prefer. The 2014 Toyota Highlander is not a bad choice, but in all the areas where it really matters, the Pilot edges it out. Plus, the Pilot has a lower initial MSRP than the Highlander, meaning that you can pay less and get more. If you are looking for a versatile family vehicle that you can also use as a work truck, the 2015 Honda Pilot is the choice for you. Make a smart investment, and invest in the Pilot.